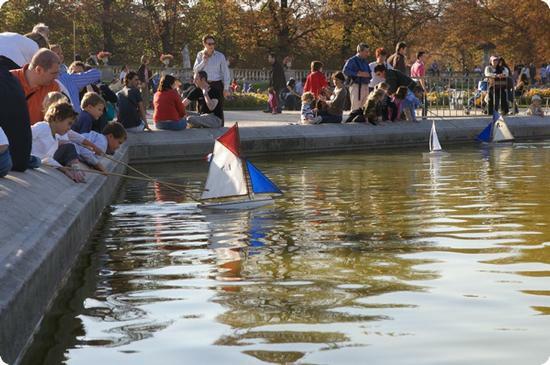 The push boats at the Luxembourg Gardens are one of the iconic pictures of Paris. It's relaxing to sit on the park benches and watch as children push their boats around the pond (as we did). Still, I dream of returning with D and E now that they are old enough to join in. Through them I'll get to live out this particular fantasy about life in Paris. Carolina on March 19, 2009 at 7:29 p.m.
this is such an awesome activity for kids. I had a bad experience with push boats though that ended us up in emergency room (but luckily no really bad injuries). I'll have to write about it another time. Anyway....it is fun and your picture shows this so well. Lorraine Akemann on March 19, 2009 at 10:35 p.m.
Ah! What a great Photo Friday shot! A highlight of one of our recent trips was a push boat pond in New Zealand. OK, I've got to dig up those shots and post them for you tomorrow. Thanks for the inspiration! Gennaro on March 20, 2009 at 12:18 a.m.
Love the photo. A great representation of daily life in the City of Lights. That would be a great place to meet locals especially having the kids play. jessie on March 20, 2009 at 8:55 a.m.
amida on March 20, 2009 at 10:27 a.m. They have this same sort of thing at Golden Gate Park in San Francisco on the weekends -- except with motorized boats. They're always fun to see. Lucia on March 20, 2009 at 11:54 a.m. I have such fond memories of these boats...can't wait to take my own kids! Wonderful picture to mark the first day of spring. Lisa Overman on March 20, 2009 at 8:23 p.m.
Atlantis Paradise Island Aquarium View. Dominique on March 22, 2009 at 9:28 a.m. The parks in Paris were so great for people watching. We loved sitting and watching folks play bocce ball or other simply fun activities like your push boats.